CFAES’s Endeavor Center, located at the OSU South Centers in Piketon, recently won Ohio State’s highest award for outreach. The center received the Distinguished Community Engagement Award during the University Outreach and Engagement Recognition Awards program May 1 in Columbus and will be Ohio State’s nominee for the national C. Peter Magrath University Community Engagement Award next year. Two other programs with CFAES ties also earned honors at the event. The Ohio Books for the World project, led by Herb Ockerman of the Department of Animal Sciences, received the Distinguished International Engagement Award, while the International Agricultural Research Initiative (iAGRI) project won the Emerging International Engagement Award. The Endeavor Center is a vibrant example of Ohio State and businesses collaborating to realize a shared vision in an economically distressed Appalachian community. Opened in 2005, the 27,000-square-foot Endeavor Center business incubator and training center is recognized as a community leader in economic development, business training and technological excellence. Technical assistance programs affiliated with or housed within the Endeavor Center include a Small Business Development Center, an International Trade Assistance Center, a Manufacturing and Technology Small Business Development Center, the Ohio Cooperative Development Center, Manufacturing Extension Partnership, and the Third Frontier Entrepreneurial Signature Program. All of these programs provide technical expertise and guidance to the small businesses housed in the incubator. In 2013 the Endeavor Center and affiliated programs provided 4,915 one-on-one consulting hours to 443 clients. As a result, the clients started 25 new businesses, obtained $9,405,750 in loans and other capital, and increased sales by nearly $3 million. In 2013 alone, more than 100 business workshops, seminars, training events and planning sessions were conducted in the Endeavor Center, attracting more than 1,500 participants. Overall, new positions created by Endeavor Center partners since its opening have had a major impact on the economic vitality of the region. Nearly 50 years ago, Herb Ockerman was on an academic trip to Brazil when he noticed that a school he visited had no books in its library. Ockerman said he thought to himself, “There are plenty of problems in the world; this is one I can do something about.” He has been collecting and shipping books overseas ever since through his Ohio Books for the World program. He has coordinated more than 1,500 shipments around the world — the current volume is about 30 tons (or about 36,000 books) twice per year. 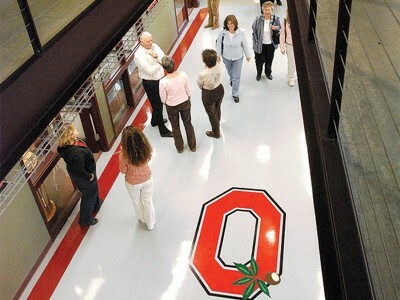 The shipments go out to Ohio State alumni in various areas for placement into local community and university libraries. Ockerman, professor of animal sciences and a founding member of the Food Innovation Center, and other volunteers spend about four hours every day cleaning, inventorying, boxing and stacking the books, which are then loaded by volunteers. He estimates (based on a book’s last sales price) the program has distributed more than $868 million worth of books. For his work on this project, Ockerman has a library in the Philippines named in his honor and has received two honorary degrees and numerous plaques from universities and governments. The local solid waste organization has given Ockerman two awards for keeping textbooks out of landfills. The International Agricultural Research Initiative (iAGRI), a five-year project led by David Kraybill of the Department of Agricultural, Environmental and Development Economics, is funded by the U.S. Agency for International Development at $24 million. The project's purpose is to increase the capacity of the Sokoine University of Agriculture (SUA) and the Ministry of Agriculture, Food Security and Cooperatives in Tanzania to achieve food security and improve the livelihoods of rural inhabitants. More than 80 percent of the Tanzanian people reside in rural areas and depend on agriculture for their livelihoods. Agricultural higher education, research and outreach are critically needed inputs to increase agricultural productivity and decrease food insecurity. iAGRI is designed to address gaps by focusing on multiple dimensions of human and institutional capacity building. By the end of the project, advanced degree training will have been provided to 120 staff members from partner institutions. To date, 84 have been placed in degree programs at Ohio State and its partner institutions. Nine collaborative agricultural research projects and four agricultural policy research projects have been funded and are building bridges between scientists from Ohio State consortium and Tanzanian research institutions and contributing to greater productivity through new technology development. To date, 399 individuals have received agricultural-sector short-term training in Tanzania; 2,738 students have received training via ICT; 40 new technologies are under development; and 22 SUA and Ohio State consortium faculty have participated in short-term professional visitations at Ohio State or other partner institutions.